I know that Christmas season is here, because I set up the tree this morning. The tree looks like moi after a night of binge drinking: tall, green, and lit. 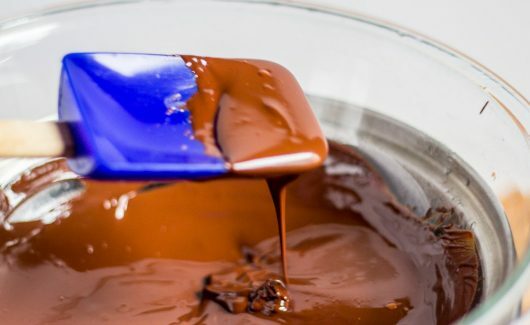 And stir slowly with a spatula until the chocolate melts into a pool of silky-smooth wonderfulness — about 5 minutes. Off heat, stir some heavy cream into the chocolate. 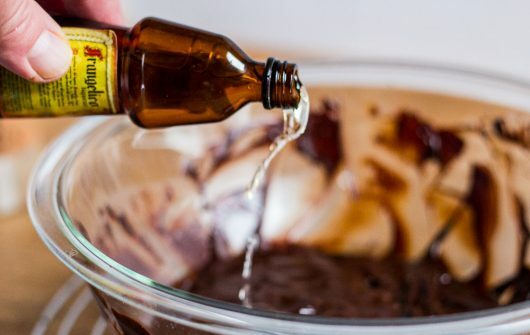 Let the chocolate mixture rest at room temperature until it firms up — 2-3 hours. Meanwhile, lick the spatula. And stir 2 teaspoons of the liqueur into the chocolate. Can’t have Frangelico in your home because of its alcohol content? Don’t make these bon-bons. And plop them onto a parchment-lined baking sheet. When you are finished, you will have approximately 2 dozen 1-inch-diameter bon-bons. 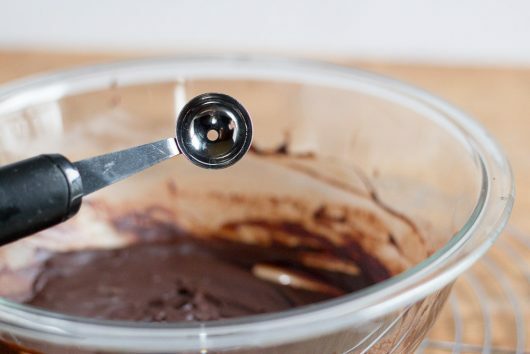 TIP: To keep the chocolate from adhering to the melon baller, dip the gadget in warm water before each use. No picture of this next step: Cover the baking sheet with plastic wrap, and freeze the works for several hours (or for up to 2 weeks). Then arrange the bon-bons on a platter, and devour them in bed. Or, if you are feeling generous, serve ’em to guests at your Christmas or New Year’s party. Hungry for more? Get my email updates. And don’t forget to post a comment below. 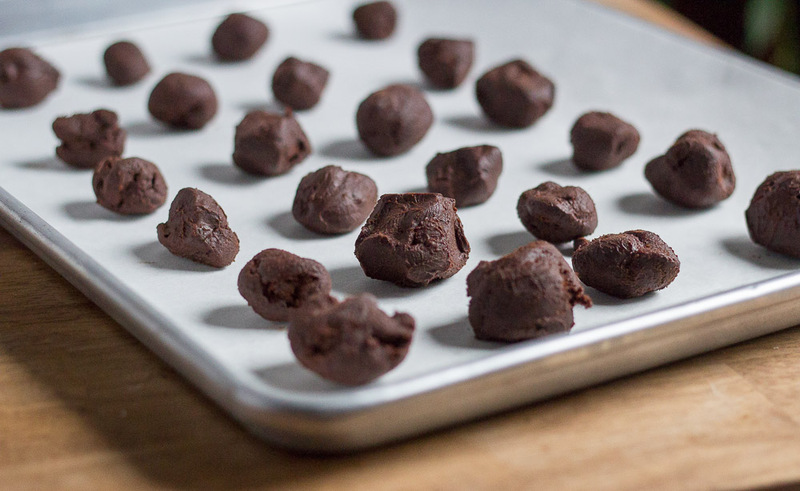 These dark, rich, not-too-sweet bon-bons are a cinch to make. Serve them at your next holiday party! 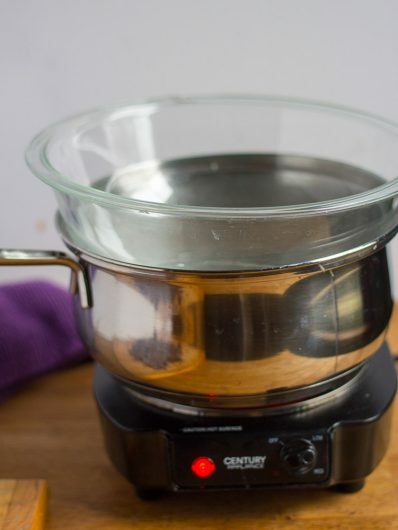 Put the chocolate in a heat-proof bowl set over a pan of simmering water. 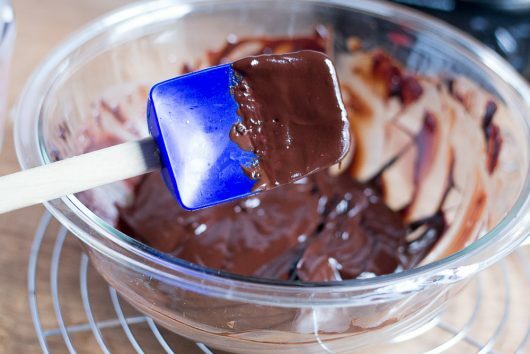 Stir slowly with a spatula until the chocolate melts into a thick, perfectly smooth puddle -- about 5 minutes. 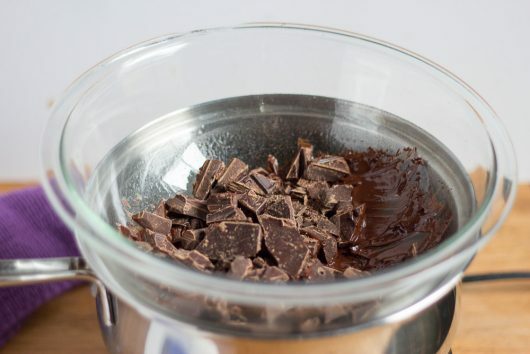 Remove the bowl from the heat, immediately add the heavy cream, and stir until the cream disappears into the chocolate. Let cool until fairly firm to the touch -- 2-3 hours. Add the Frangelico to the chocolate mixture, and stir well to combine. Using a melon baller, form the chocolate into 24 1-inch-diameter balls. 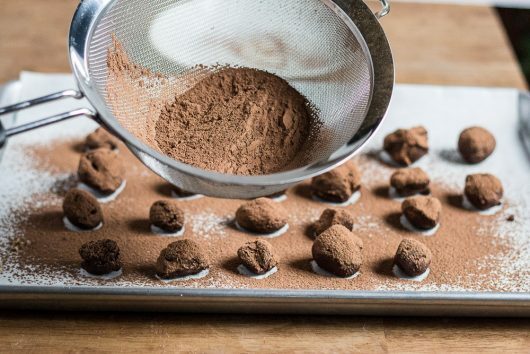 Arrange the balls on a parchment lined baking sheet. Freeze for several hours, or cover the baking sheet with plastic wrap, and freeze for up to 2 weeks. 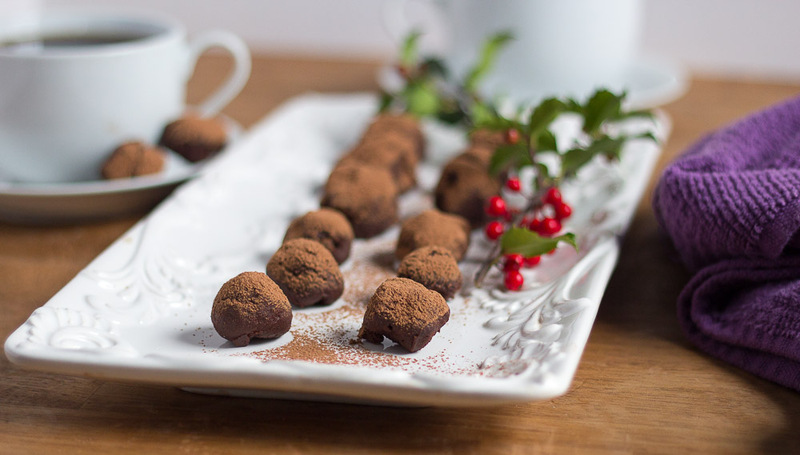 On serving day, dust the bon-bons with the cocoa powder. Then arrange them on a pretty platter, and serve. Well, yum for sure. Thanks, Kevin. Easy to make ahead and torture myself with the knowledge that they are there, lurking in the freezer, calling my name. maybe a photo of the purse you found the Frangelica in? Being the purveyor of said Frangelico, (and serious chocoholic!!) sweet Kevin brought me a sampling of these fine bon bons!!! Oh my stars n garters they are delicious!!! Not too sweet, deeply darkly chocolate with a kiss of hazelnutty boozey goodness…silky texture…oh my mouth is watering just thinking about them!!! Thanks for sharing Kevin!!!! 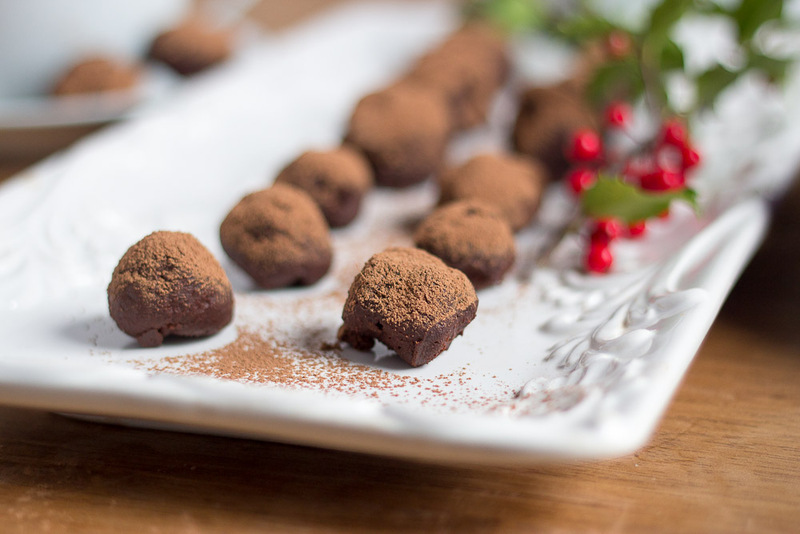 Little globes of chocolate dusted with cocoa. I need to buy a melon baller right now. I can always count on you for a scrumptious treat and a good chuckle. Thank you! Ha Ha! I Love your presentation. Oh my! Simply wonderful recipe! Just the excus I needed to visit the liquor store today! Thank You! Thanks for the fabulous recipe. Can’t wait to get to work! Question..Why do you melt chocolate over boiling water instead of melting it in the microwave? Where do you buy Frangelico at? Is there a preferred brand? For those of the no alcohol persuasion, heat the cream with a bunch of loose Earl Grey tea leaves & use the resulting infusion (after straining out the tea leaves of course). I’m made Earl Grey truffles for years, but think it is definitely time to try the Fra Angelico! I very much would like to make these. Why do u add the Frangelica after its set and not before? It seems like it would be hard to stir in. This sounds wonderful and I can’t wait to try the recipe. I’d also suggest that almost any flavored liquor can be used. Since they would all look alike think of the surprises when you bit into one–hazelnut or orange or raspberry, etc. Great gift in a cute box!! Love the recipe, but not hazelnuts. Does anybody have another flavored liquor that would be delicious? Actually, Frangelico is a brand of hazelnut liqueur, and is sold at your local liquor outlet. Ah! YOU must be the owner of said purse! Mary Poppins’ bag has *nothing* on yours! My hubby is allergic to dairy. Would leaving out the cream make a huge difference? Looks great! Frangelico is a favorite! What’s not to like!? Godiva Chocolate Liqueur would be great in these as well. I will have to make a batch of these with the Godiva Chocolate Liqueur and a batch with the Frangelico. Thank you Kevin!! Love your recipe but am not a hazelnut fan. I will try with another liqueur for sure. Your posts are like a warm fuzzy greeting from an old friend. Love ya! Try coconut oil instead of cream, it sets really well too! Tomorrow, I will be visiting my hardresser. A woven basket with a home made bottle of Pinot Grigio, a festive kitchen towel & hot pads, and why not a few of these? I mean who doesn’t like a lil’ chocolate with their vino? Thanks buddy – you ROCK! 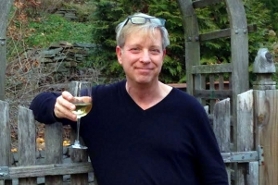 Hi Debbie – Chocolate and wine: A heavenly pairing! 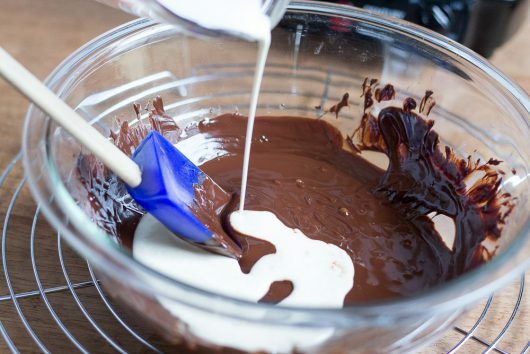 Your recipe gets a few items to put in the dishwasher and you can also get chocolate on the counter top. So my favorite is a 40 oz. 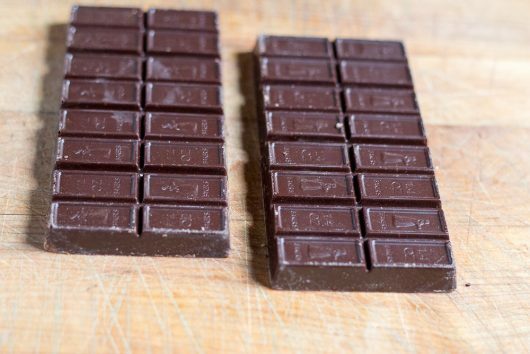 bar of milk chocolate from Trader Joe’s and cutting board(to save the knife or counter). 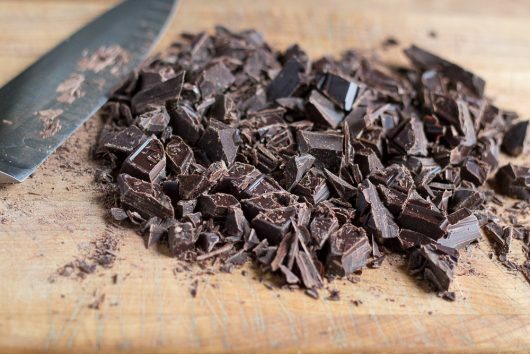 Chop a block of chocolate off and then chop into smaller pieces. Place on napkin and enjoy. Now put knife back and you have a clean kitchen! Have a Happy Safe & Healthy New Year! These sound soooo gooood! Question: How soft do they get after being removed from the freezer? Can they be boxed with crispy cookies? Can’t wait to make this for all the potluck Christmas parties I do not have time to bake for. All I can say is: Oh Yum!!! You are brilliant…. Frangelico carried in a purse….. genius… best darn idea I’ve seen all holiday season! Cheers! Awesome Kevin except I do not like Frangelico so made some with RUM and some with COINTREAU then I had to taste them to see which was better and keep tasting to be sure and now I have none and have to start again. ohmy! 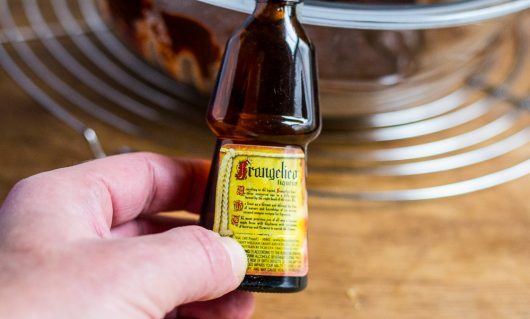 I was going to ask if Dark Rum could be used instead of Frangelico, since I have some I using in a Tipsy cake. Love all the ingredients in these. I will be making them soon since my mouth is watering now. Oh yeah. this has to be THE one I/we can all experiment with to find our favorite booze. .and wake up tomorrow wondering ” who was driving that truck ?”! Thanks for sharing your Healing secrets and letting my play with my grammar as well. almond, and cherry. The possibilities are endless! 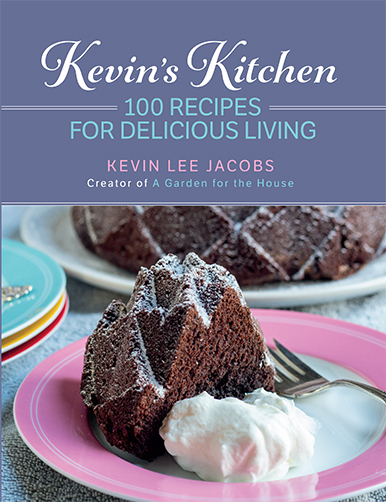 Thanks Kevin for the recipe of an easy to make, decadent treat! Guess I will need to buy a larger purse now…. What percentage of cocoa do you recommend for the bittersweet chocolate? I’m curious about Lisa’s point — why wait til it’s set to add the Frangelico? It seems as though that would make it more difficult to incorporate. I love the idea of an orange liqueur with ground cardamom 🙂 or chocolate liqueur with cinnamon. The options are limited only by our imaginations and liquor cabinets! The tiny bottles are a great way of experimenting without breaking the bank, Montana liquor stores often have these available at the counter. I’ve always wanted to make bon-bons. I’m thinking of an orange or mint liqueur. Since I’m not a fan of hazelnuts, I thought I’d try ground pecans or almonds. Too many changes? Happy Holiday Baking! I just made those gorgeous little balls today and I did 1/2 with Frangelico and 1/2 with Baileys. Can’t wait to retreive them from the freezer next Sunday when I have family over !!! Big thank you again and have a very Merry Christmas. May 2018 be a happy and healthy one for you two. I am going to make these for my Xmas party, on Saturday. I might substitute Chambord for the Frangelico, just because I love it so much.